Though you can easily uninstall F-secure using the add / remove feature of Windows from the control panel, But it may still leave traces in the system. So to remove all traces from the computer we require a uninstaller tool or removal tool specifically made for the specific antivirus provided by their manufacturer. Because antivirus requires a deep installation to protect computer from virus attacks, So uninstalling it from add / remove programs does not remove it completely. It may leave some registry entries or files. F-secure removal tool can remove it completely. This tool is compatible with Windows 10, 8, 7, XP and for both 32 bit and 64 bit platforms. 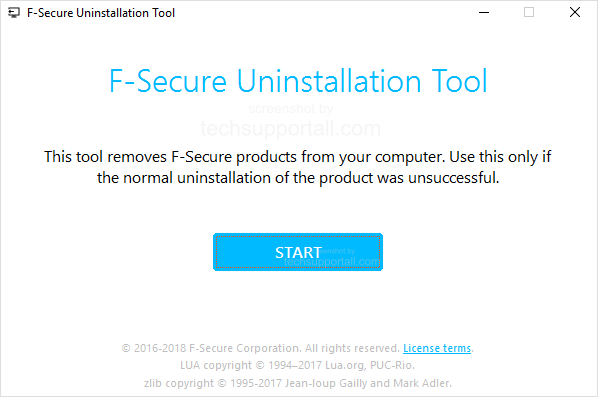 To uninstall from other version go directly to the f-secure website where you can download uninstaller utility for Windows, Mac and Linux etc. This tool is helpful in solving many issues related to re-installation and license activation. This may also eliminate compatibility issues when you try to install another security software product of F-Secure or some other company. Download F-Secure Uninstallation tool from the F-Secure website. Run it click yes if asked. A windows will come up. Click on the Start button to start the removal process. It will ask for the “Remove all f-secure products” or “Select what you want to remove”. We suggest to select remove all. It will quickly complete the process. Close the window and restart Windows to finish the uninstallation process. If the above process unable to solve to issue then you can try a third party software Revo uninstaller tool for forceful uninstall and cleaning junks from the PC. Please share your experience with us using the below comment box.